Finished Jun 2018. Final score: 4 / 5. The author lives in my hometown. A fun read: Space Camp meets Hunger Games but rated PG, save a few swear words. Cassandra Gupta will dare mighty things. Newly 18 years old, with her whole life ahead of her, she is going to completely walk away from everything she knows and love to pursue her dream: To travel to outer space. Her entire life has been centered around this goal. She works hard at school in all the relevant subjects. She shuns friends and other common young adult pursuits (never been kissed). She took an unpaid internship at NASA Marshal Center in Huntsville -all just to get closer to this dream. With zero time to prepare, Cassie is given the chance of a lifetime. She leaves for a winner-takes-all competition for a top secret mission to fly in space. There is no information provided during this. Only grueling physical and mental tests. This book could best be described as Hunger Games meets Space Camp. The ages range from 18 (the youngest being Cassie) to around 23 (one candidate was married). Rather than involuntarily fighting for their lives, the "tributes" (the best young adults from all over the world) are in a competition to become an astronaut (thankfully the book explains why youth is important). Shut off from the world for weeks, they can leave at any time. The book was well designed (except the ending). As each portion was revealed, I thought back to previous events and they made more sense. It had excellent pace. There was never a dull moment. No detours. Chekhov (from Chekhov's gun) would approve. The book did not try to teach me a lesson. Books that are secretly a sermon or trying to push a political agenda exhaust me. All I want from my scifi is entertainment. This book delivers. I think we can all agree "space exploration" is well enough justification in itself. The love story was gently woven in to the narrative. I thought it was very believable. As a guy reader, I appreciate that it was not the main focus. I'm a fully grown man with a background in engineering, and I actually cried a little during the goodbyes with friends and family before Cassie went to space. God help me if Heather Kaczynski decides to start writing tragedies. Almost completely devoid of science. "Here we have this amazing tech. We have no idea how it works." "Now lets connect Cassie to a computer and see it just works." I'm not suggesting technobabble (modify the phase variance of the deflector dish), but a touch of the science of NASA would've been nice. The crew is traveling a very far distance. Cassie's thoughts were all about her drive to succeed, frequent bouts of self-doubt, and relationships with her teammates / competitors. I suppose that consumes a lot of mental bandwidth. However, nowhere in the story do I remember her actually sitting down, hashing out a plan, and then executing it. Cassie felt so reactionary to every event. Cassie feels a little too perfect. She loves exercising, vegetables, studying, playing classical music, and friendly professional competition. On top of all those positives, she at times jeopardizes her own chances to help a fellow competitor. Her only real fault is second-guessing how awesome she is. It's the old job interview joke: "What is your biggest weakness?" "I work too hard." I would have loved for her to do something bad or a bit of back-stabbing. She felt 1 dimensional. The book is very predictable. I suppose it's hard to get too upset about this. I did not worry that Katniss Everdeen will survive the Hunger Games. I did not doubt Cassie would make it to space. The question is how that will happen. I would have still preferred a few more unexpected turns along the way. "Ender's Game" was also a series of youth competitions with a leaderboard, yet I was always at the edge of my seat wondering how Ender would complete each test. (Book was amazing. Movie was terrible, fyi). For the big reveal at the end, the story started dropping light-years wide plot holes as it set up book 2. This book is a solid young adult scifi entry. I look forward to the sequel when it gets released. 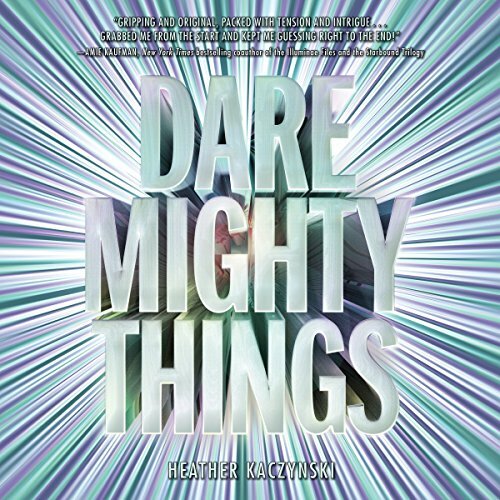 "Dare Mighty Things" gets a 4 out of 5 stars and deserves the praise it has received. Discuss Dare Mighty Things (Book 1) in the forums.